Trauma or Crime Scenes can be disturbing; nevertheless they are left to family members and property owners to clean themselves. KRI doesn’t think that someone personally affected by an event should be cleaning it up, or that any type of biohazard environment, including blood, bodily fluid or someone deceased should be cleaned by anyone other than a professional. There are serious risks involved with cleaning up a crime scene. That’s why we offer our Professional Crime Scene Cleanup Services to Texas, Arkansas, Oklahoma, Louisiana, and New Mexico residents, property and business owners. Let us help you get your life back to as normal as possible by providing immediate responses and timely cleanup, sanitation and disinfecting of the crime scene. The sooner it is disinfected, the safer and the easier it can be to try and return to the life you still have. The area of contamination spreads with every person that walks by or has close contact, consequently the risks become greater; also removal of a gruesome scene can help lessen the reminders of the trauma experienced. 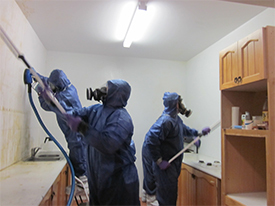 Our professional biohazard cleanup crew can eliminate the hazardous conditions and return your home or building back to a safe and sterile environment for everyone. The unfortunate truth is that loved ones are left to deal with the aftermath of a death, whether it be homicide, suicide or an accident – KRI feels no one should have to clean the remains of their beloved lost family members or friends. The crime has already been committed, don’t relive it by trying to put the pieces of your home or another location back together, because the truth is that it will never be quite the same and cleaning the scene yourself will only cause further pain. If it is expense that is driving you to self-clean your contaminated property, we would like you to be aware that insurance often covers much of the costs of our cleanup services and in rare cases where there is no insurance we can work with you to set up payment arrangements that are reasonable for your circumstances. When a crime personally happens to you or to someone close to you it is understandable that you‘ll need time to process the events. We understand this because we deal with victims of unfortunate events often. But others, in the general public may not understand and media or neighbors may press you and others close for information, which you’re not ready to give. Our professional cleanup crew understands that the events that have happened are your story and only yours to tell. We never disclose pictures or information about the events or area to anyone that doesn’t have the need to know. Contact KRI for a confidential crime scene clean up consultation at 1-888-382-2930, email at [email protected] or fill out our service inquiry form on our contact page.